Shopping for Star Trek Clocks? It's time for warp drive! Let the USS Enterprise NCC-1701 help you keep track of the time. 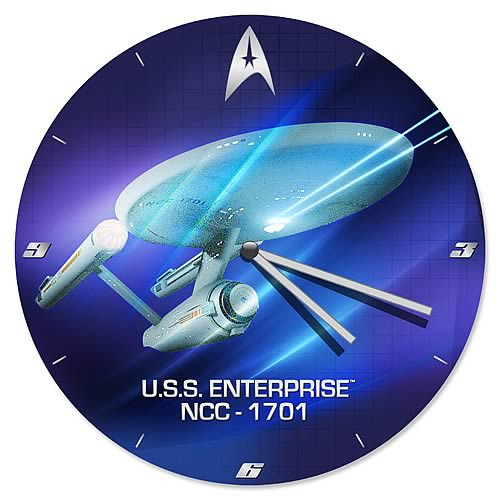 This eye-catching Star Trek The Original Series USS Enterprise NCC-1701 Wood Wall Clock features a cool blue grid design background with a large image of the USS Enterprise NCC-1701 from the Star Trek: The Original Series television show. Plus, this item also features the Star Trek Starfleet logo in place of the top number 12, and the words "U.S.S. Enterprise NCC-1701" below the image of the ship. It measures about 13-inches tall.